Thousands of global health professionals from different sectors and regions of the world will converge on New Orleans, Louisiana for the American Society of Tropical Medicine and Hygiene Annual Meeting this week. With “Outbreaks” as the theme, this year’s meeting is particularly relevant for typhoid researchers and advocates as recent typhoid outbreaks have impacted populations in Africa and Asia. In Zimbabwe, health officials have been working to control a typhoid outbreak in multiple cities throughout the year. In fact, the capital city of Harare has been battling recurring typhoid outbreaks since late 2016. There is an urgency to control this outbreak as studies in Zimbabwe have found an increase in resistance to first-line antibiotics including ciprofloxacin, making it more difficult and expensive to treat typhoid cases. In Pakistan, the first outbreak of extensively drug-resistant typhoid in the world was reported in the city of Hyderabad. Researchers and government officials were quick to organize a vaccination campaign with the new typhoid conjugate vaccine to control the outbreak and recently celebrated the 100,000th dose administered. Efforts are still underway to stop the outbreak as it has spread to Karachi. Researchers from Aga Khan University will present new data from the outbreak at several meeting sessions. Key to controlling outbreaks – both typhoid and other diseases – is sharing new data and collaborating across sectors and between partners. Take on Typhoid is doing just this at the annual meeting. 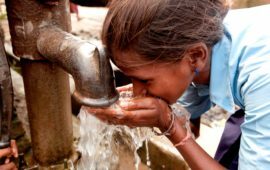 Today, the Coalition against Typhoid is organizing a symposium, “Integration for Impact: Preventing typhoid through policy, vaccines, and WASH,” that will share research on the impact of integrated prevention and control methods, including TCVs, to address the disease alongside the policy decisions that aim to make these tools accessible. A full list of typhoid presentations and activities is available on our website and you can connect with us on Twitter @PreventTyphoid. We hope to see you there!